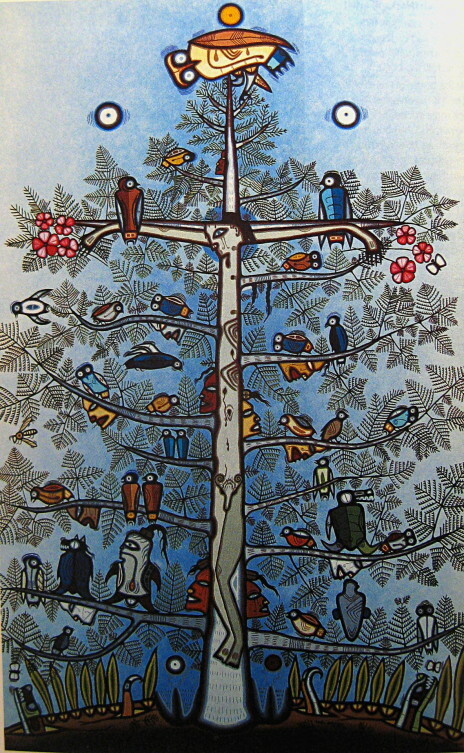 "The Hawk and the Owls: a Vision of Healing"
Illustration: The Tree of Life by M'Chigeeng Ojibwe painter Blake Debassige. Read about the symbolic meaning of this iconic painting. "Our spiritual path was designed way before we were born on Mother Earth; many times you'll be tested and many times you'll fail. "Spiritual Paths" or "The Tree Of Life" is a simple teaching to understand and all you need to do is to take a good look at yourself and see what you truly need. When we try to get things that our neighbours have, this is where our Spiritual Path and design gets confused and ultimately fail. This is where people get confused and create problems in their life. 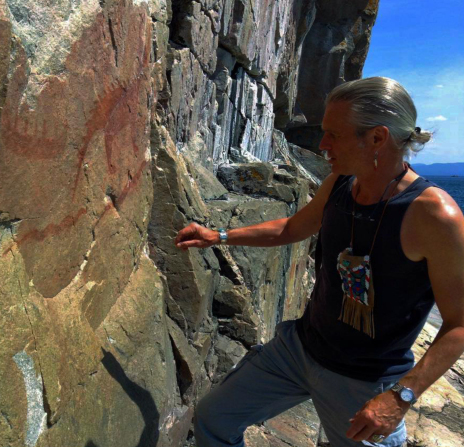 Welcome to part 2 of my new blog series titled Teachings from the Tree of Life, in which I connect the storytelling art of myself and kindred artists with an old Teaching based on the ancient Anishinaabe spiritual/philosophical principle of mino-bimaadiziwin that countless generations of ancestors handed down to us from the time they still lived in the old homeland along the Atlantic coast. 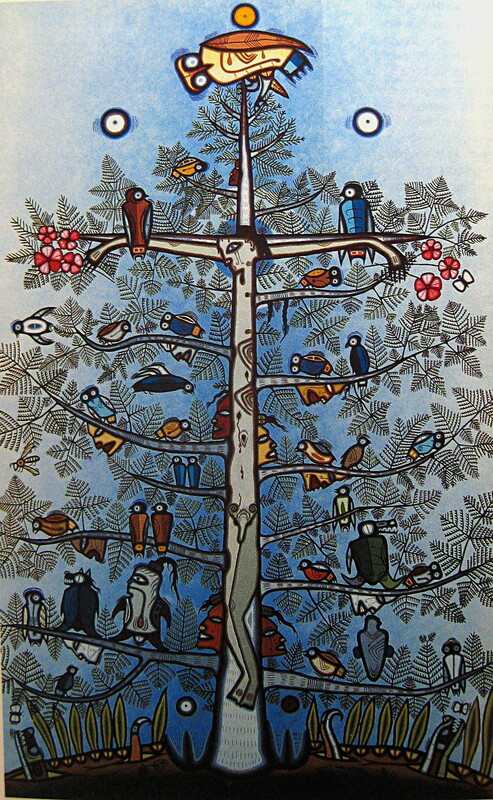 The story that I tell today features artwork by the late Miskwaabik Animikii, the Father of the Native Woodland Art, and Second Generation Medicine (Woodland) painters Simone McLeod and Blake Debassige. Last night, in the early morning around 3 am a good and trusted friend (I call her Misaabe) woke up as she heard her grandchild cry! She went in his room, held him, and rocked him. Then laid him back down and as she was walking away she heard wings. My friend looked outside and there, in the tree in the front of her house, was a hawk sitting on a branch flanked by two owls. (It was the same hawk that my friend had seen many times in her dreams and she has always associated me with it.) The owls were looking right at her; as she said to them "talk to me," she heard many different languages that she could not understand. My friend told me about this vision and asked me what I make of it. The following is about healing from having been treated badly by someone of our People who is damaged and needs healing herself. What my friend saw last night makes visible what i saw in my head and felt in my heart earlier on tonight. This is about healing from the way some of our loved ones, who belong to our own People, treat us. There is a very strong healing message in what my friend saw last night. 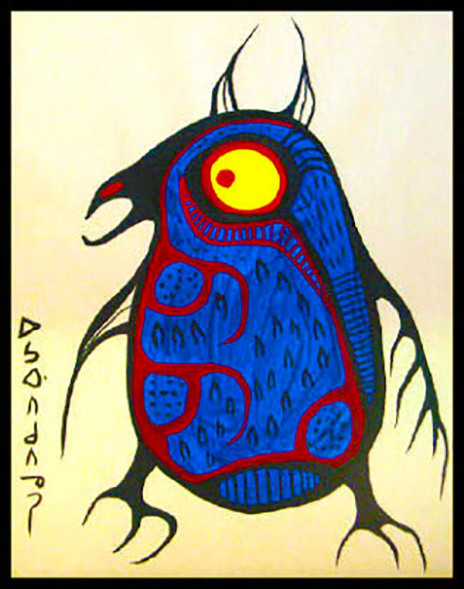 I have heard that Gekek, the hawk and Gookooko'oo the owl both offer a window onto the old, old Ojibwe Anishinaabe world in terms of cyclic and cosmic relationships. To our ancestors, Gekek with his sharp vision was an epitome of the virtues of deliberation and foresight. Kookooko'oo, the owl, and the magic sounds he makes at night, have always presented a double mirror with life on one side and death on the other. ** Owl displays contrasting spiritual powers that are interrelated at the same time as he is associated with both giizhig (sky) and aki (earth) as well as with nibi (the water) - and their respective underworlds. He symbolizes light and dark, the natural and the supernatural. He stands for mental therapy and wholeness. He heralds spring season and along with it, regeneration and new life. So the way I see it, just like the seeds in the rattle of the Midewiwin healer that, when shaken, acoustically ward off evil spirits, the two Kookooko'oog that my friend saw dispel the evil spirit that others project on my friend and me. Like the sound of the rattle, the presence and the voice of Kookooko'oo dispel sickness and the evil spirits that cause mental suffering. My friend's family members, what they did and still are doing to her. What someone, someone of our People whom I loved and trusted and whom I thought was my soulmate for life did and still tries to do to me. The hawk, my friend and I both know what his role is; Gekek has visited her repeatedly in her dreams and we know that he is a messenger from the spirit world who relates stories and messages to us about past lives and our role and position in our present lives here on aki. The owls flanking Gekek the hawk, they bring insight and healing. Tonight, minutes before my friend related to me her vision of the hawk and the owls, I happened to see very clearly the manipulative game the person who for the past seven years was, or pretended to be, my friend and life partner has been playing, and is still playing, with me. The owls that appeared in my friend's vision show me the contradictions in this person's nature and behavior - which, I have no doubt, are caused by the traumas the Europeans and their "educative" system inflicted on many generations of our People. At the same time, the owls bring us clarity and, in the long run, healing. I see it clearly now: the person who betrayed me meant the world to me for seven years; I still care for her and i know it will take me another 7 years to get over the loss of this once so beautiful friendship. It is going to be a slow process. I know now I must not rush it. The owls my good friend saw on the tree branch and who spoke to her in a strange language (I figure it must have been a forgotten language that our ancestors' ancestors spoke): they try to tell us something. The message is this: it is of no use to try to heal the wounds that others, the damaged ones, have caused us, and the hurt and pain they inflict on us, in a speedy way. It doesn't work that way. We will have to mourn and mend our wounds in our own pace. The damage caused by the breakdown of the intimate relationship we used to have with the wrongdoer is internal and goes deep; it goes to the heart of who we are. We will have to find back our worth for ourselves, within ourselves and focus on filling our own void and replacing our anger without hanging on to a past friendship that proved to be an illusion anyway. We must ban anger from our hearts, and replace it for positive values like self-respect, compassion, and generosity. We must learn to listen to the wounded person inside us. We must find the root of the plant of negativity and evil that the other person planted in us, and only when we find it and recognize and understand someone else planted it there and it doesn't belong in the soil of our soul, the suffering will lessen. This is the hardest part and cannot be done overnight. The hawk will fly again but the owls tell her to take time to heal. Giiwenh. This is how i interpret the vision that my friend had last night. Her ancestors spoke to her, trough the owls. Miigwech gibizindaw noongom mii dash gidaadizookoon. Thank you for listening to my story today. Giga-waabamin wayiiba, I hope to see you again soon. *Excerpt from Mishmountains Blogspot, "Teachings to the Tree Of Life." ** Michael Pomedli: Living with Animals - Ojibwe Spirit Powers, University of Toronto Press 2014, p. 109. I enjoy reading, thanks for sharing. This story contains a deep truth. I learned from it.